Leonardo Da Vinci knew the value of simplicity. Polycrete engineers do, too. Polycrete Big Block ICF System is the enemy of complicated construction methods. A few minor variations on a single product makes it easy to design with. Ordering and jobsite logistics are effortless. Installation is fast, sure and clean. Meet the Big Block: It’s different from the other ICFs. Simplicity is two panels of reinforced EPS joined by folding metal cross ties. The variations are height and width. That's all. Very few parts. Easy take-offs. Easy ordering. Easy jobsite storage and easy installation. Big Block™ 2’ X 8’: These are the ICF forms. The standard EPS is 2-1/2" thick per side (see below for other panel thicknesses).They come in four standard core thicknesses (5-5/8”; 7-5/8”; 9-5/8”; 11-5/8”). Need something custom? Polycrete can make you any core width from 5-5/8” to 24” . Over 5,600 square feet on a truck delivered to your jobsite. Big Block™ Taper Top: One (or both) panels tapers to 5/8” thick foam at the top to produce a wider concrete surface. Makes it easier to form a brick ledge, transition to wood or steel framing, or create a ledge for floor systems. Split Blok™ : We make three different panel heights -- 12", 18" and 24". You can mix and match them on the same block. Eliminates the need to rip 2’ forms in the field. Reduces waste and makes it easy to form odd height walls. Double Welded Starter Base: Galvanized steel track that is attached to the footing and used to secure the first course of Big Block™. Makes it easier to level the first course, prevents “snaking” and serves as the lowest level attachment point for interior and exterior finishes. Big Block Premium: Features Neopor, BASF's new high R value EPS. Tiny graphite particles boost insulation properties by 13% over standard Type II expanded polystyrene. We can make any Polycrete ICF product for you in Neopor and it only costs a few pennies extra. Building codes are evolving and you need more choice in insulation values. Big Block 1200 is a standard customization with 1.75” thick foam that comes in standard Type II EPS or Neopor. Polycrete’s steel wire mesh makes this the only thin panel ICF that performs in the field. R-Stak™ adds R value. 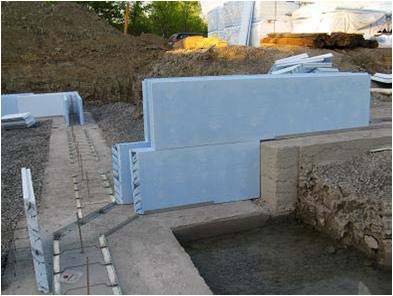 These 2’ X 8’ EPS panels in 2.5” or 4” thickness slip inside the Big Block ICF and boost the insulation value to R31 and R37. No gimmicks, no “Effective R Value” salesman spiel. It’s just more insulation. It’s simple to install, and our proprietary expander clip holds it solid without glue or screws. Want more insulation? Customization's no problem.You can have as much insulation as you want up to 23" for 6" of concrete and it's just as easy to install. Giraffe ICF Bracing is the highest quality bracing on the market. Allows you to build walls 10', 12' and 24' high. Integrated bracing and scaffolding system makes wall construction and concrete pumping easy. PolycreteUSA is a Giraffe Bracing dealer. Contact us for special pricing. Aluminum Corner Guides are used to brace 90° and 135° (45°) corners. They are tools that are re-used and should last many years. They are made from 3/16” thick aluminum, are 8” oneach side and 10’ tall. You’ll need one to brace each corner during the pour. They are removed after the concrete cures and re-used. Rigid Foam Boards for under slab insulation. We supply all the EPS or XPS insulation you need. EPS in 1#, 1.5# and 2# densities as thick or thin as you need. R10 XPS in 25psi. Meets all building codes. Our pricing will surprise you. Call or email today for a quote. To get started, call or email us today. Advice is free. We'll help with your take offs and we're ready to go.